There have been a few posts lately about the true nature of Buddhism, whether that nature has been defiled, and (mostly with erroneous logic and lousy data) whether one of the greatest defilers is the Momentum of Mindfulness. A sub-clause to all this cogitating is a need to prove that the Mindfulness Movement is really a pernicious process of oppressing the masses to be sheep and fodder for the Capitalist Overlords. I actually have no argument for the latter because, in my experience, the mindfulness modality is becoming a bit of a dumping ground for hard-to-treat and hard-to-diagnose mental health issues; those Capitalist Overlords may be the over-burdened health care systems that want relief through a 21st century mode of chemical constraints and the ice-water dunking baths of yore. But I digress. Justin Whitaker, my favourite male Buddhisty philosopher, wrote a great post on the differentiation of Buddhism as a philosophy and a religion. And it is accompanied by a mind-blowing work of art in which his photo-shopping places the Buddha smack down in the middle of a symposium or a wonder of philosophers. I really liked it. Not only does it place the Buddha in the scrum representing various branches of knowledge but specifically placed in the one related to understanding through the determination of primary causes. The post riffs on an article by Michael McGhee asking “Is Buddhism a religion?” Other than a bit of a sniper shot at the Momentum of Mindfulness and the NHS (UK’s health care system) decree that Mindfulness-Based Cognitive Therapy is the cat’s meow these days, there is much of worth in the article. I am compelled yet again to dig into the reality that today’s Buddhism in North America (being much more driven by the American zeitgeist than we care to admit) is not my granny’s Buddhism. But then again, today’s Burmese Buddhist vihara is not my granny’s sangha either. It seems a tough notion to resolve in our minds. And perhaps that’s the start of the problem: we’re trying to think our way through this evolution rather than actually experience it. But thinking is what we do. McGhee points out that the while a-religionists claim Buddhism is not a religion, they go on to accessorize their own beliefs with the language and conceptual hooks of Buddhism. This seems to be a bad thing, a sort of theft or spiritual plagarizing – which I can see may be hurtful because if you’re going to say the meal offered is not suitable for your purposes, don’t then walk away with the silverware. But I do feel his pain. And equally, I love the reactivity when I say that Buddhism is about renunciation; the dilemma it poses if positively Freudian! In that case Buddhist practice becomes a form of ethical preparation, reducing the forms of self-preoccupation that impede a concern for justice. This aspect of Buddhism has led some commentators to say that it is more like a philosophy of life than a religion. This contrast with religion relies too heavily on the assimilation of religion to religious belief and it neglects the ceremonial and ritual and community-building aspects of the various religions, including Buddhism. 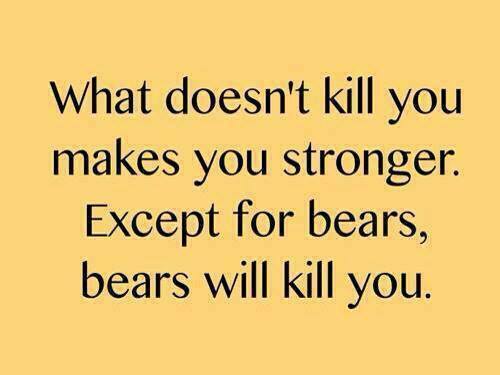 Now that leads us to the graphic above about bears. (You were wondering, I know.) In my first retreat, all the talks and exchanges were in French. My friends and the facilitators were very kind to translate everything for me, despite my assurances that I was perfectly bilingual. On the second day of the retreat, we were called to a meeting and warned that there was a black bear loose on the grounds and to be careful. Those camping by the centre were invited to sleep in the zendo. I realized after the meeting that no one had translated any of the exchanges for me. From this I concluded that it was vastly more dangerous to not have an accurate understanding of the Dharma than of a potentially lethal bear. The evolution of Buddhism and of various modalities of psychotherapy is like that. Better to be accurate in one’s intention to practice which directs one’s attention to the details of practice and improves one’s stance to the inner experience which includes ethical prepardeness. How this plays out in your life of practice will depend on whether the bear gets to you before the Dharma. This entry was posted in readings, reflections and tagged Buddhism, ethics, mindfulness, philosophy, practice. Bookmark the permalink. As a result, or maybe as a cause, I can’t get too worked up about these kinds of religious debates (remember when people argued about whether Windows or Mac OS was better?). Call me an apostate, but I’m willing to accept even a little relief from suffering and its causes as part of the path of awakening. We all have to start somewhere and a little relief can go a long way. If someone attains full cessation at some point, that would be incredible! But, until then, how about just a little more kindness, generosity, equanimity, compassion, and the like? Thanks, Barry! It’s very helpful to repeat these historical points (true or not they are now real anyway) because in the scrambling of opinions we tend to forget that much of our views are co-created or constructed. I’ll happily call you “Apostate!” The work of lifting the weight of suffering comes in many forms and entered through 10, 000 doors. I think we have to come down off our high towers of defining enlightenment in such a way that it only reflects what we would want for ourselves. Most people who practice mindfulness are grateful that enlightenment for them means sleeping when they sleep, eating when they eat, and removing the hooks of past and future one by one. Many thanks for the kind words, Genju. This is something I’d like to keep digging into because there are so many perspectives from which it can be approached. In terms of modern Mindfulness practices, we might start by suggesting an initial split between those, like you, who are aware of the importance of ethics (and perhaps even issues around right view) and those who play “don’t ask, don’t tell” with your time off the meditation cushion. Without this holistic approach, and just taking mindfulness as a tool or technique, it it easy to conceive of really horrible people *using* mindfulness to further their horrible agendas, as was the case of Anders Breivik, to whom I believe McGhee was alluding. As I recall, Breivik testified that he used meditation to numb himself so he could focus fully and clearly on his task of killing people. Now that’s not the fault of any mindfulness teacher, but it should raise red flags about the idea of mindfulness alone being a ‘pathway to the cessation of suffering’. So if this is the witch-hunt you mentioned at my blog, it at least has some big names involved – all the more reason to discuss it further, and, as I suggested, from as may perspectives as possible. Thanks, Justin, for continuing the conversation. I prefer not to begin splitting this into groups because that creates the idea of bounded entities and moves away from the relational piece that is missing in the critiques and defenses of secular mindfulness. The practice and techniques used in Buddhism (yes, they are) have found a larger field and this is going to cause protectionism because – guess what – Buddhists are people too. And being so they are victim to all the three poisons themselves no matter how big their names. What concerns me is the lack of critical thinking and the level of hysteria among people had I thought capable of better cognitive control. Not one of the critiques (other than Titmus) has actually looked into the programs, the way they are developed, the thought that has been given to adapt the teachings so that they have the integrity of the Dharma AND meet the constraints of highly regulated health care delivery regulations. 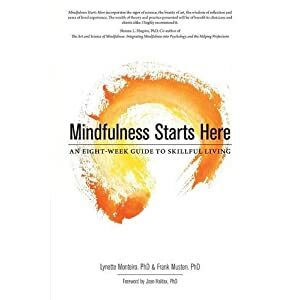 There are no data provided by Buddhist critics of mindfulness to show that people have become sheep in corporations that ask for mindfulness trainings. Sure there’s a potential but that potential is available in everything from providing healthy lunches to health care benefits. And having big name critics doesn’t make faulty logic more credible btw. In fact, to believe that meditation and the Dharma Truths of impermanence, nonself, and suffering will lull people into a robotic daze exposes a greater ignorance of the power of the Dharma than an insidiousness of therapeutic mindfulness. The Mindfulness Movement is not blameless either. It’s rife with cutthroats, self-service, in-groups, and other manifestations of greed, anger, and ignorance. It too can be arrogant and protectionistic. All the more reason for the more skilled and open-minded Dharma teachers to lend a hand, to enter into relationship with them and ensure the teachings hold the theoretical and philosophical integrity of the Dharma. There’s no easy solution because, as Kenneth Gergen points out, both sides believe they are doing good. And when these edges of good contact there is going to be a reactivity and a creation selves. The more important question is not how do we control the other to live our ethics but rather can we see that the only way out is in the cultivation of a relational way of being with each other. I agree especially with the last bit about needing to work together. My suggestion of dividing our analysis into holistic mindfulness teachers vs those who try to isolate mindfulness as a tool for whatever you want in life is to help bring this out of the abstract. Reading Loy and Purser, McGhee, and most recently Robert Scharf (which is unfortunately now behind a paywall at Tricycle), it’s easy to ask “just who are they talking about?” when they diagnose this problem in the West. I’ve seen Kenneth Folk and the Buddhist Geeks named specifically by others, but I wasn’t terribly convinced with the arguments made against them. I have been convinced, however, by arguments against Michael Roach, who departed from tradition, teaching a number of things that he personally felt were “enlightening” – but in fact led to tragedy. Ken Mcleod, several big Zen teachers, etc, all have caused significant harm with their selective interpretations and/or practices of Buddhism – each in different ways, so it’s worth looking closely at each. But each veered from tradition and harmed people. The danger, I think, is that the Mindfulness Movement will grow its own legs and we’ll see a string of cases of people being harmed by it in the years to come; followed by backlash against the movement and/or Buddhism as a whole. Others might simply be very financially successful, organize conferences, and lead workshops that are filled with people who otherwise might find their way to more helpful/holistic teachers. But again, more specific critiques on the parts of Loy, Purser, etc would be helpful. On the other hand, if we’re going to fault the logic of the critics, we need to concretely re-present it. Who exactly are “they” – the critics who you’re speaking about? What is their logic and how, specifically, is it flawed? …. I just listened to most of the Ted Meissner interview (http://secularbuddhism.org/2013/07/20/episode-178-david-loy-and-ron-purser-buddhist-questions-about-mindfulness/) … One of the things I would reiterate from that talk is David saying that their goal isn’t to refute or dismiss Mindfulness as a tool in the West, but rather to raise these larger questions about how much it is actually working toward a larger transformation. Returning to the start, I do think there are mindfulness teachers who recognize and teach this way. So using ‘mindfulness’ as a selling point or skillful means doesn’t worry me. But those who lose sight of the other seven limbs because they don’t fit well with our capitalist culture aren’t necessarily doing anyone any good. I hesitate to separate out the “dharma-ethics-informed” MB teachers from the those who are not interested in the ethics issue simply because I sometimes wonder if that’s a bit of a red herring. There’s much cachet in flying the principled flag and I wonder if that may not be muddying the waters unwittingly. In my article on Scribd, I tried to argue that the confusion arise from confounding the various “mindfulnesses” in the Canon (the Abdhidhamma particularly) but I need more work on that argument. This is a concern and one that is hotly debated in the Mindfulness Movement community. One camp claims that it would never happen because the teachers’ own deep practice would activate the principle of “do-no-harm.” I don’t tend to put must faith in this; in fact, no different from the Buddhist community, I would suspect that harm has already been done. It’s just not politic to say so yet. Another camp argues that our professional regulations offer protection and prevent harm. It’s a better stance but still a stretch to assume that health care ethics will be sufficient to prevent harm as the annual reports of complaints shows. Furthermore, many “teachers” are not health care professionals or any sort of professional with ethical guidelines and accountability. Donald McCown just wrote a terrific book (Ethical Space of Mindfulness in Clinical Practice) covering a lot of this. What concerns me more than the level of nobility of the teacher is the assumption that the teacher’s (putative) embodied ethics will be acquired by the students vicariously. I think that’s a more dangerous assumption and one that underlies the absence of ethics teachings in most MB programs (except ours, MiCBT, and ACT). However, I do understand that it arises out of an anxiety that we might be imposing our values on others. In the mental health world, we live with the false belief that therapy is value-free and that we are blank screens to our patients. The latter may be true but in a somewhat unflattering manner! I will give folks like Rebecca Crane of Bangor University (Wales) great praise however. She’s developed a graduate program in Teaching Mindfulness that focuses on the teacher’s development (without any mention of ethics as part of their practice). It’s a good start. If nothing else, it sets the bar for the future. Although I doubt that will staunch the growth of shysters and ne-er-do-wells. While I agree sadly with Titmuss that the corporate consultants teaching mindfulness in organizations are unlikely to change the behaviours of the corporations (org stated values are always noble; it's the shadow mission we need to understand), I do believe that this should not stop us from offering the teaching so that the individuals can make better choices. And then, who knows. My burning question now is how do we bring the ethics piece into the content of an MB program and make that the litmus test of the integrity of secular mindfulness approaches. There will always be such things. And it happens in the Buddhist community too. None are right or wholesome if they do damage but our experiences of each teach us discernment. And unfortunately that particular path is individual. Some folks get tremendous mileage from some types of Buddhist or Mindfulness teachers and retreats, some don’t. Conferences etc. are important however. They give us the opportunity to be transparent about our intentions, sometimes to sip the Kool-Aid, and often to review the Emperor’s New Clothes. They also give us a chance to see for ourselves how the community interacts and to register with, resign from or re-commit ourselves to the ethos.